The car frame plant for KAMAZ K5-generation trucks is preparing for installation of technological equipment. The construction work of the industrial site started last autumn. "The partner of KAMAZ for the project which is the venture Daimler KAMAZ RUS managed to receive classification decision from the Federal Customs Service, allowing to import welding and painting equipment under single customs code, - Deputy Development Director on cooperation with joint venture Vladislav Pastushenko stated. - This will greatly shorten delivery time". He also reported, that in total, 150 trucks with Comau welding equipment and 400 trucks with Dürr painting equipment should be delivered in Naberezhnye Chenlny. Tanks for painting delivered by 20 trucks are pending the installation. The first shipment arrived in October 2017, on the eve of putting into commission the corp, build by "KAMAZ" in the frames of the joint project with Daimler. Currently the work is underway in all the spaces of the new plant. Shelves to accommodate the accessories are installed in logistics terminal. 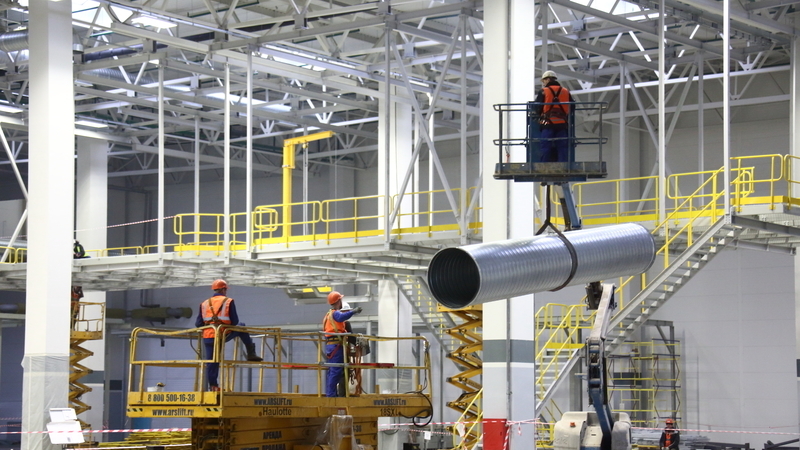 In welding shop, the installation of metal structures for further "binding" of conveyor lines and 95 robots that will work on 2 levels has already been finished. Now the installation of powerful air ducts, marking the floor is performed. Commissioning works of the welding and painting production are scheduled for June, and the trial series of car frame should be launched in October. Serial production of KAMAZ K5 generation trucks with new cabins is scheduled for 2019.